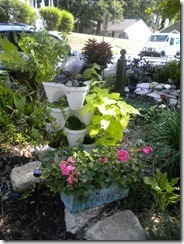 I love to create interesting vignettes in my garden. Sometimes they work and sometimes they don’t. 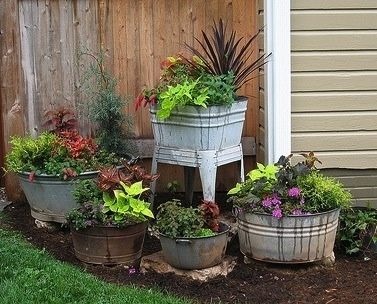 The above is one of my favorites (not mine unfortunately), and I’m searching junk shops for old galvanized pots. I’m especially interested in one on an stand which I assume were created for pioneer homemakers as a wash-day convenience. Boy has convenience come a long way, Baby. 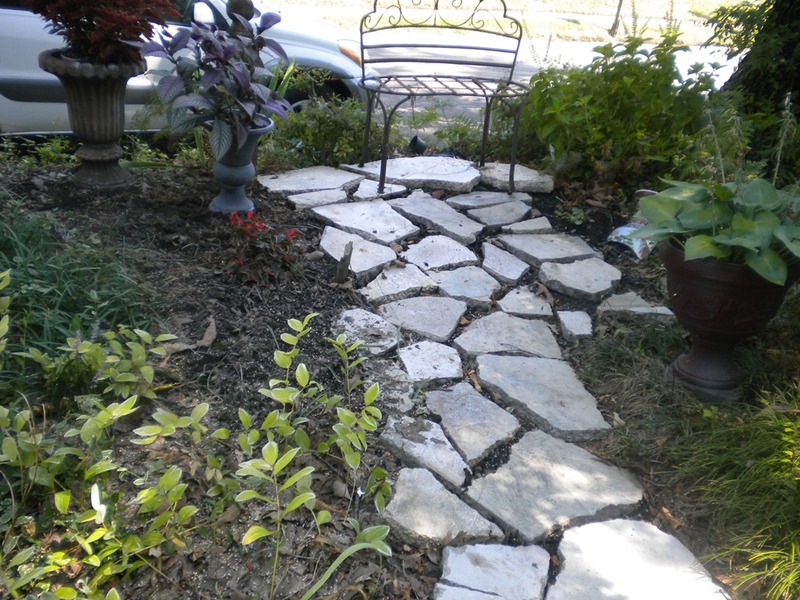 An example of what worked is my project to create the “Path to nowhere.” It’s an example of how garbage can be recycled. A nearby apartment complex was tearing down the second floor walkway and stacking the stones by the dumpster. I saved the the sanitation workers a lot of trouble when I backed my truck into the parking lot and loaded up the stones which were smooth and lightweight – unlike the thick concrete from sidewalks and parking lots I’ve hauled home before! Brenda rushed over and picked up what I left. 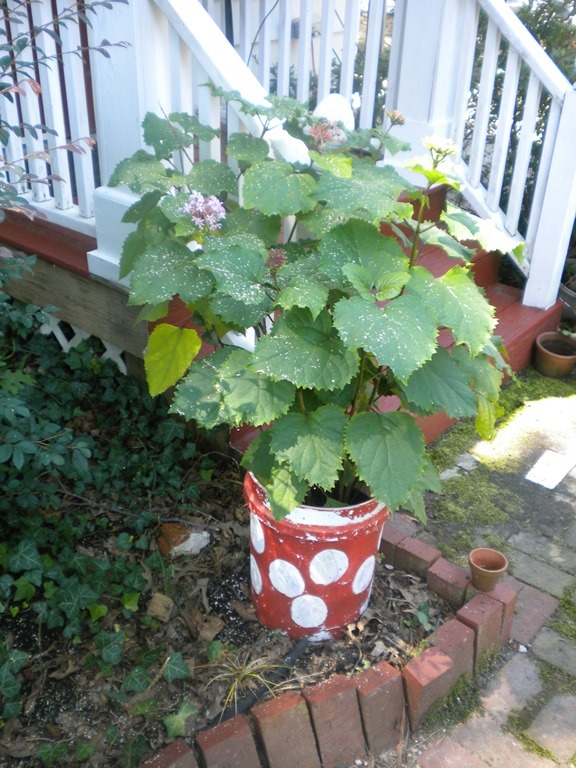 A great way to reuse a pickle bucket – this one is from Pepper’s Restaurant – is to paint with whatever design moves you and tuck a plant inside. (Be sure to drill holes.). The one pictured is a pass-along mystery bush Brenda gave me last spring. I was too lazy to plant it in the ground and apparently it likes its pickle bucket home just fine – it’s rewarding me with beautiful pink blooms – almost like hydrangas. Then there’s the stack of pots William gave me for Mother’s Day. Love it, and it looks interesting with NOTHING growing in it. 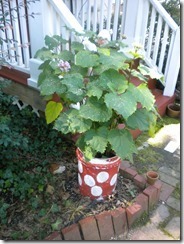 There’s a wonderful window box blooming in front – a gift from Norma – which she had already planted with geraniums. Now, that’s a true friend. Norma, Judy, Marie and I are going to an estate sale on Saturday. I’ll be looking for the old garden stuff. There’s no room in the inn for anything else inside. 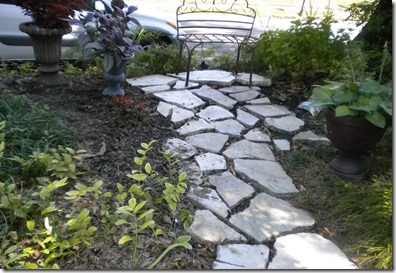 This entry was posted in Gardening and tagged Junkyard mentality, Recycling for the garden, Reusing stone from walk for garden path by Emily Jones. Bookmark the permalink. Thinking back to our earlier conversation of getting rid of “stuff” but I do love the galvanized pots. Maybe I could use them for a little while and then pass on to you. Be on the lookout for a wash tub like the one in the lead photo. I love it. Doubt we’ll find one tomorrow at the estate sale.